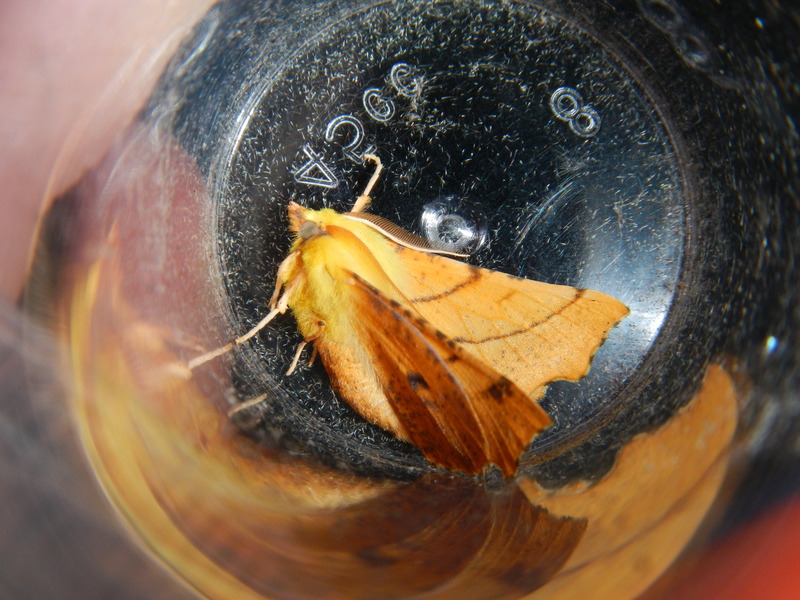 Canary-shouldered, Purple and Early, a Thorny Moth Trap! When I checked the moth trap on the morning of August the 2nd, there weren’t as many moths as there usually is. However, there were many species I’ve never seen before, including three species of Thorns. Thorns can be identified by the way they hold their wings – not flat like most moths but angled upwards. 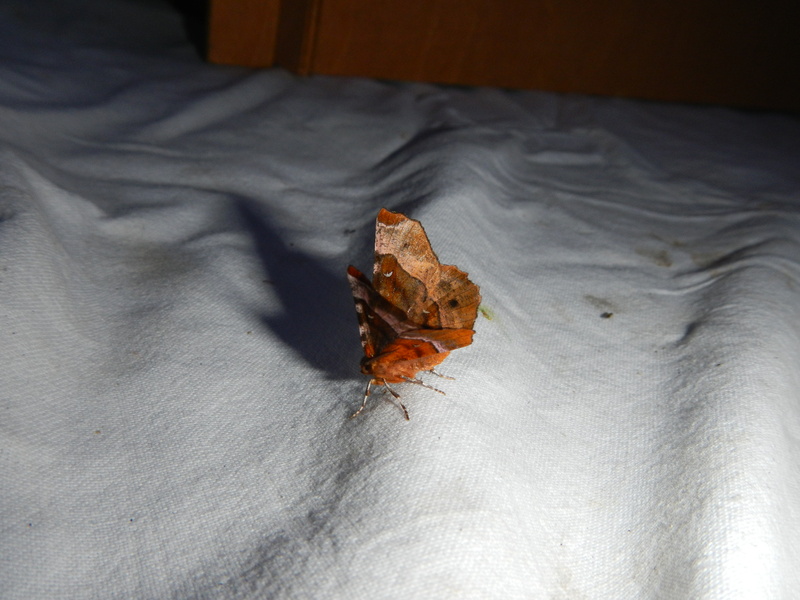 The first species of Thorn I found by the trap was the Purple Thorn, which was resting on the sheet. It’s a pretty large moth, the individual I caught had a wingspan of 34mm. However that’s not the species’ maximum wingspan. The Purple Thorn has two broods (generations) each year, the first flying in April and May and the second flying in July and August. The first brood has a larger wingspan, whereas the second has a smaller wingspan, and the moth we caught was from the second brood. The species is fairly common in the south, and prefers habitats like woodland and heathland. However, it gets scarcer as you move northwards. It is patchily distributed in Scotland, with the main stronghold being around the Moray Firth. 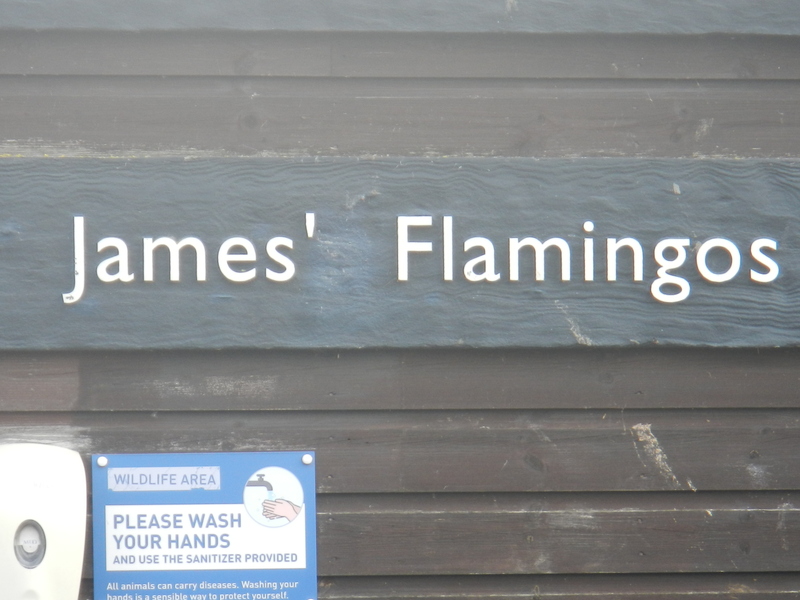 It’s common in Wales, but practically absent from Ireland. The second species found, the Canary-shouldered Thorn, was perched on the metal bit which holds up the bulb. It’s the prettiest species we caught, with a bright canary-yellow thorax and yellowy-orange wings. It is also the largest species, even larger than the Purple Thorn, and it also only has one generation. It’s widespread throughout the UK, from Cornwall to Orkney, although like the Purple Thorn, it’s scarcer in Scotland. However, this might be because there are fewer recorders up in the highlands, and there are many concentrated around the South-East (like me). The Canary-shouldered Thorn can also be found in Northern Ireland and even the Isle of Man. 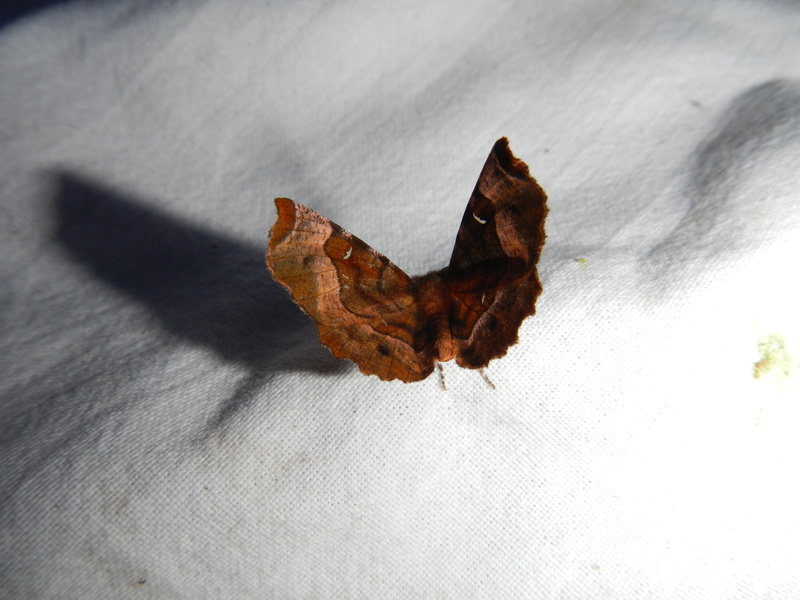 The last Thorn species is called the Early Thorn. 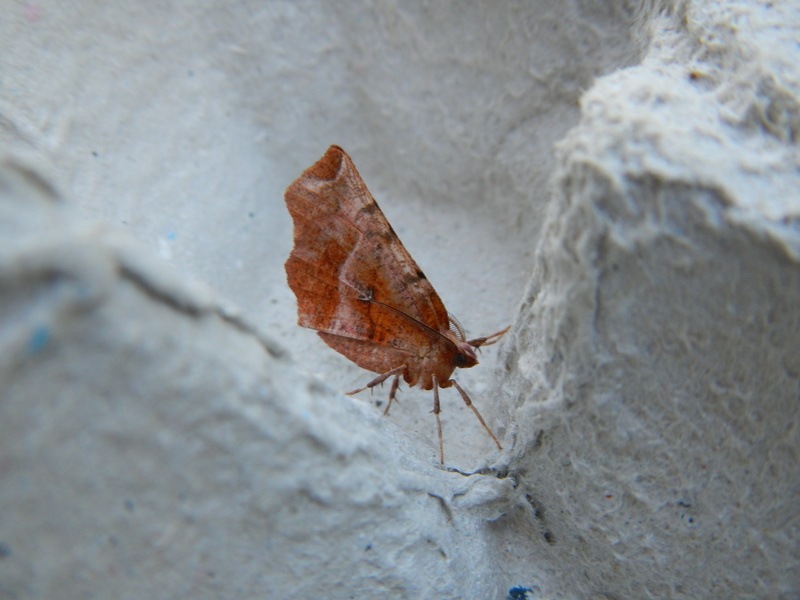 It’s by far the smallest species and, like the Purple Thorn, has two broods each year. We caught an individual from the second brood which flies from August-September. The first flies from April-May. Even though it might be the smallest, it’s the most widely distributed, being found on Scilly as well as England, Northern Ireland, Wales, Scotland (including Orkney) and the Isle of Man. It’s identifiable by the way it holds its wings, flat above the body like a butterfly. 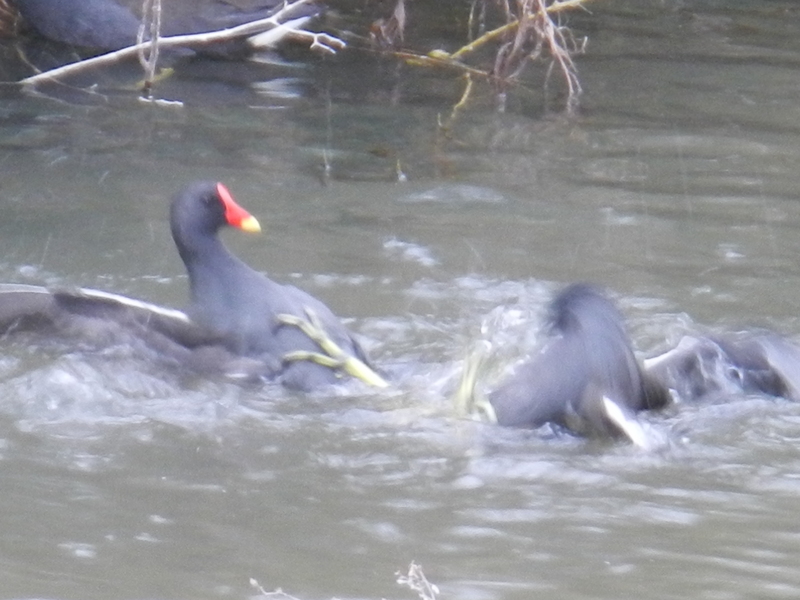 A melanic (dark) form of this species is fairly common in Northern England, but rare down here in the South. 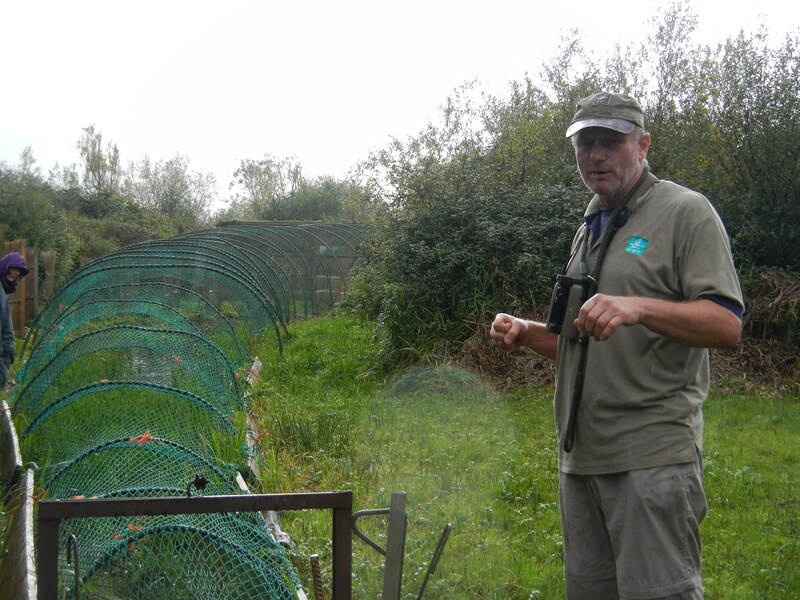 The reason we put the moth trap out was because I had an event planned for the following morning. I thought that as I lived in a small, quiet village it would be nice to teach the people who live in my village a little bit about the moths found in their area. I invited all the people I knew from the village and was pleasantly surprised that quite a few people decided to come! 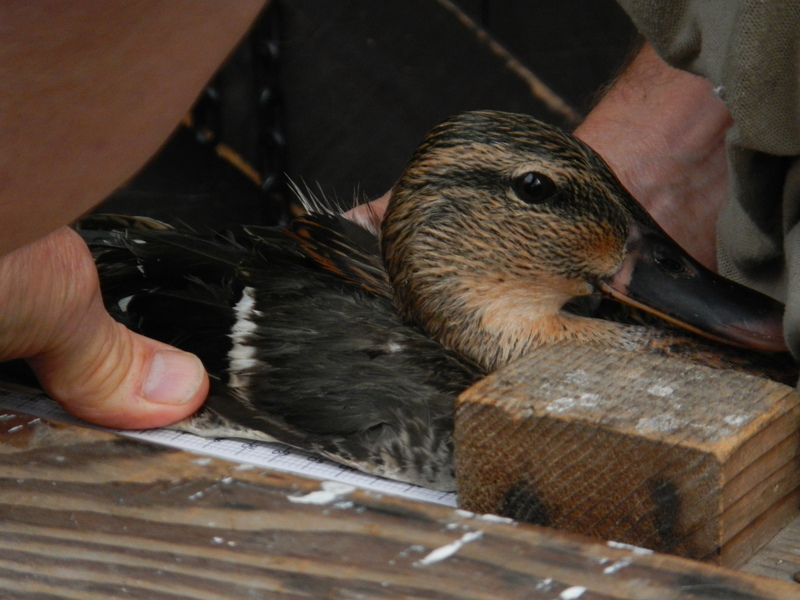 I even got a few to sign up to my monthly natural history newsletter, which I will be writing for the residents. The beginning of March has been a very busy one, with some creatures coming out of hibernation and some early wild flowers starting to bloom. One of the most interesting plants that have emerged now are the Dutch Crocuses in our front garden. They are very pretty, with the colours purple, pink, white and one orange one which mysteriously disappeared. They are great for photography and I have taken many photos of them, these are a few of them. 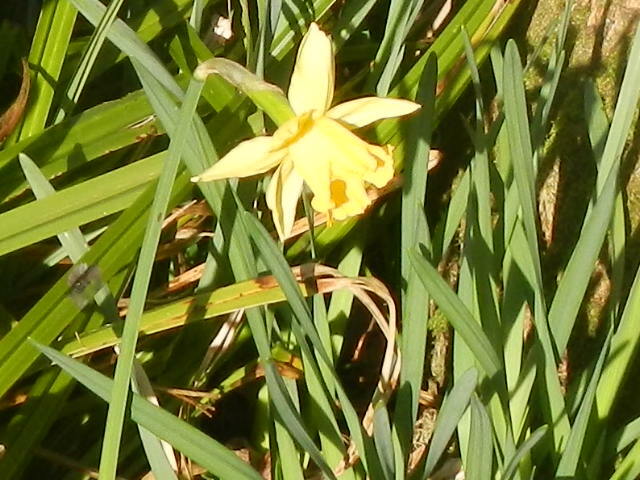 Just today I saw the first blooming daffodil in our garden, one of many that are sure to come! 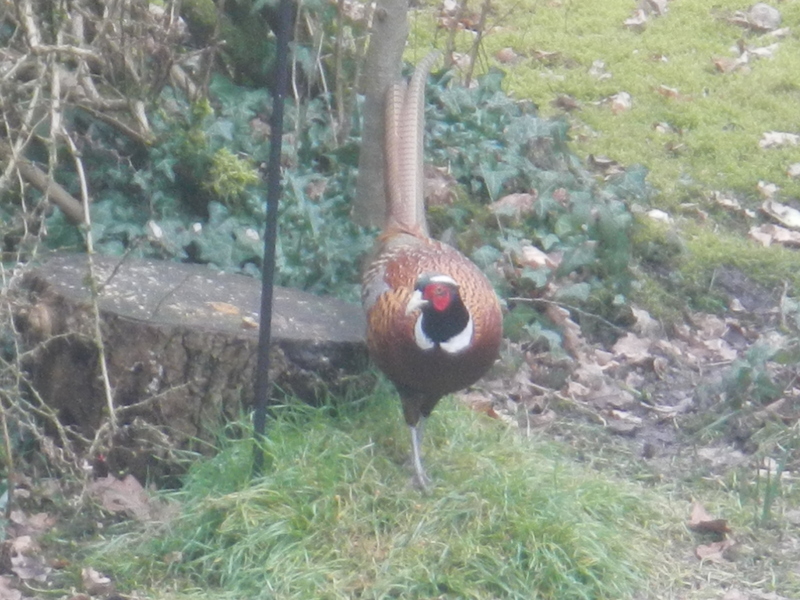 Last weekend I had a nice surprise as a male Ring Necked Pheasant strutted into our garden, only the second I’ve seen in our garden! 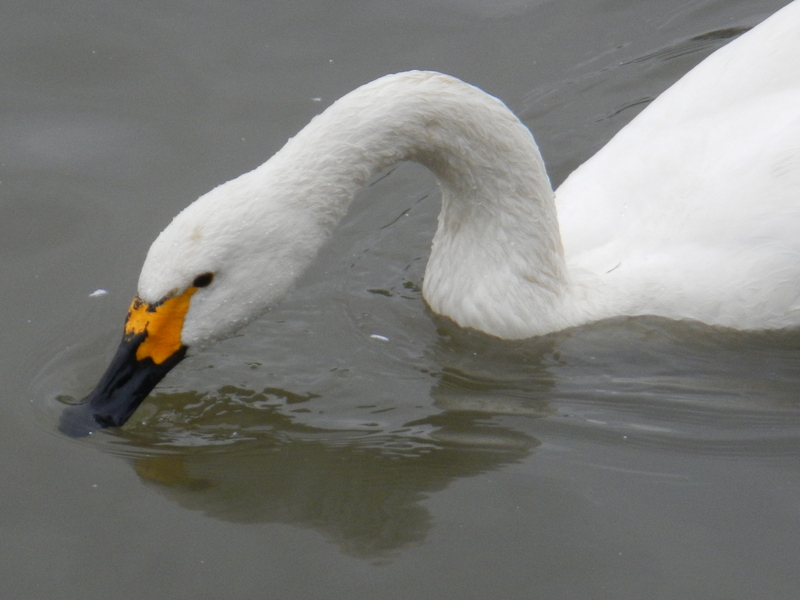 This one was also a very interesting variation, as well as the white neck ring, it had white eyebrows! I’ve never seen a Ring Necked Pheasant with white eyebrows before, so that made it very interesting! The highlight of March so far though has to be the vole that peeped out of the patch of Hedera near the bird feeder on the first of March, we thought it had just come out of hibernation. 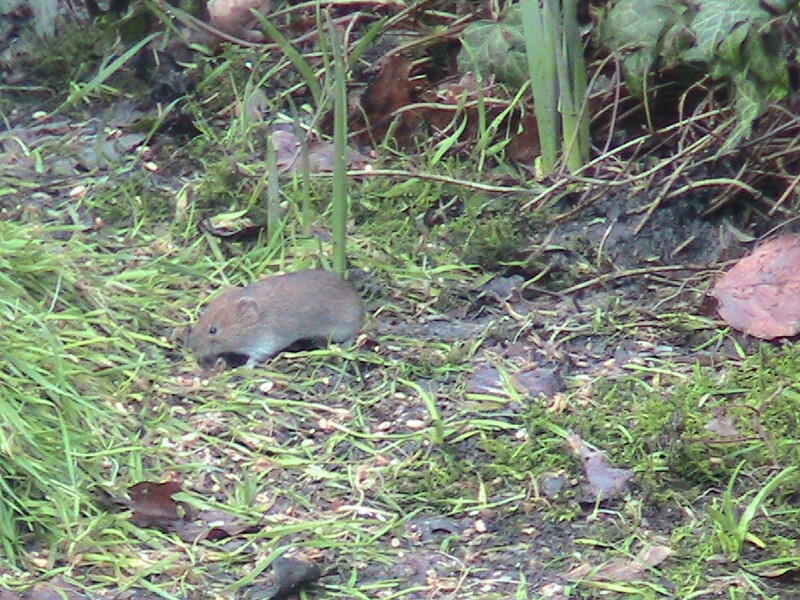 From the photo I took of it, we suspected either Bank Vole or Field Vole because of the overall colouration and shape. The one distinguishing feature between the Bank and the Field Voles is the length of their tails, the Bank Vole has a much longer tail than the one of the Field Vole. The thing is, the tail seems to be invisible in the photo! One the way back from Ardingly a few days ago when I was driving through the small village, My dad spotted a young Roe Deer on the road. It was trying to jump the fence between the road and the spinney in between two houses, but it was too small. I haven’t seen a Roe Deer in our village for quite a while, the last sighting was probably before Christmas, but that was an injured female with a fawn. This deer was a fawn too and I’m wondering if the female had died, because on the way back from Ardingly today, I saw the leg of a Roe Deer on the road! 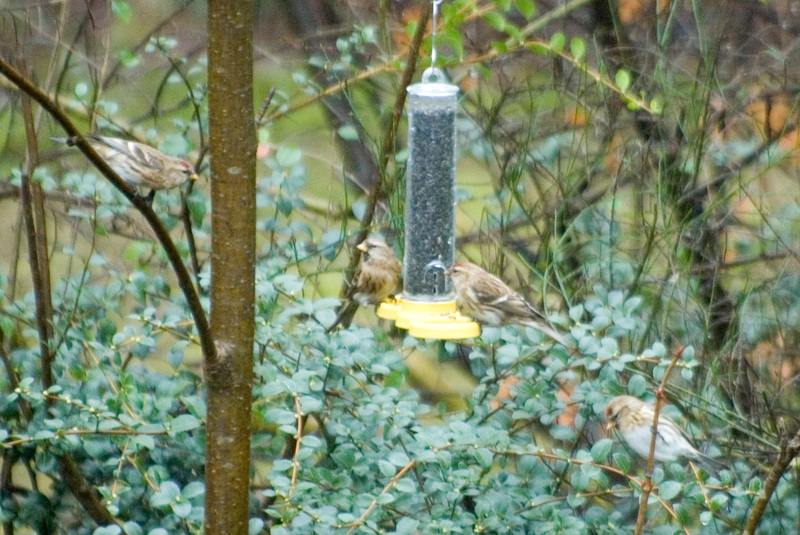 The Redpoll action in our back garden has increased for two reasons, one being that I found the place the flock go when they are not on the feeder and two being that there has been numerous visits by the local Goldfinch. I found the place where the Redpolls go when I was lichen hunting (or lichening!) in the back garden. I was checking for lichens on the pile of logs by the bush border when I heard a very unimpressive call coming from the Hedera covered Oak. I looked around and I saw a little brown job hopping from twig to twig. Then I saw another one and another one, until there were a total of seven Redpolls gathering around me! The Goldfinch first visited when I wasn’t at home but at Ardingly, though my dad saw it and told me when I got home. The first time I actually saw it was earlier in February, when it flew to the Nyger feeder briefly, scaring all the Redpolls already there. 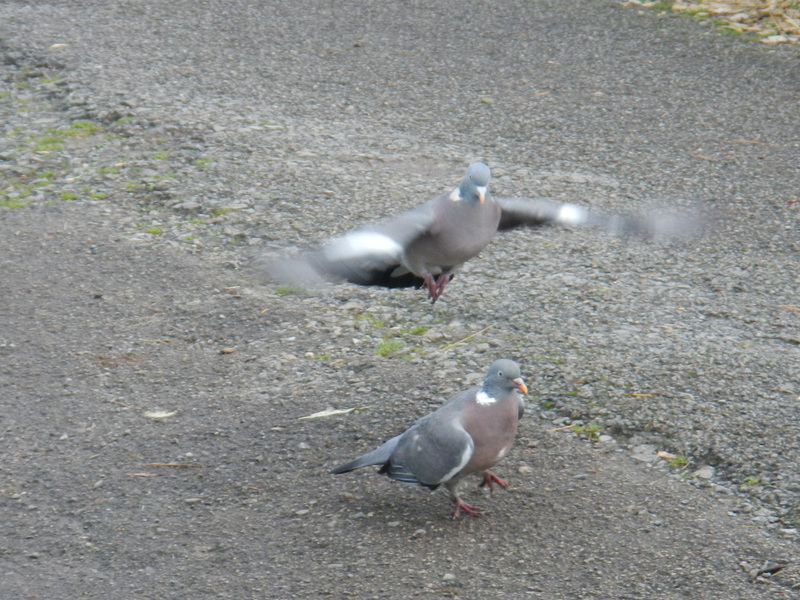 I have also seen it today, it made a brief occurrence then flew off. Now I would like to advertise iSpot, a brilliant website to share nature or to identify your wildlife observations. 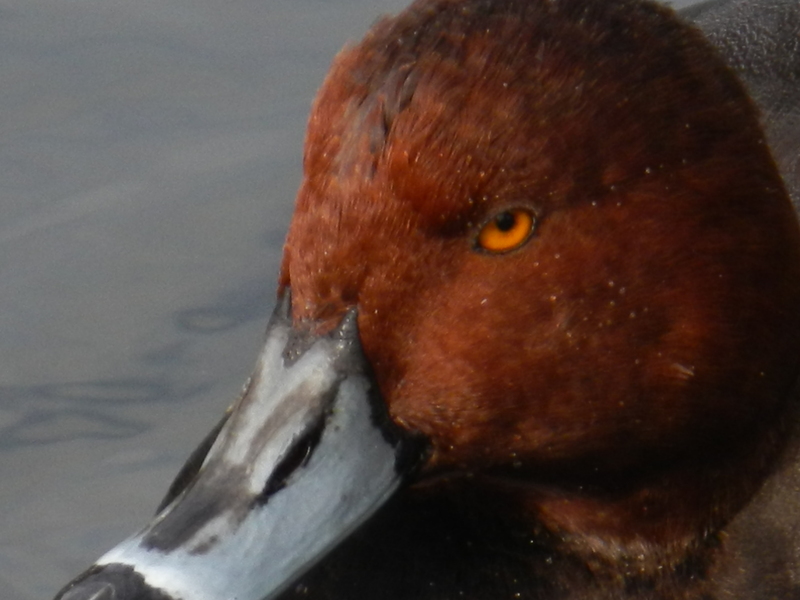 iSpot is a great website to post your identifications of wildlife, with photos and descriptions. When you post an observation other people on iSpot can confirm the identification for you or add a revised identification. 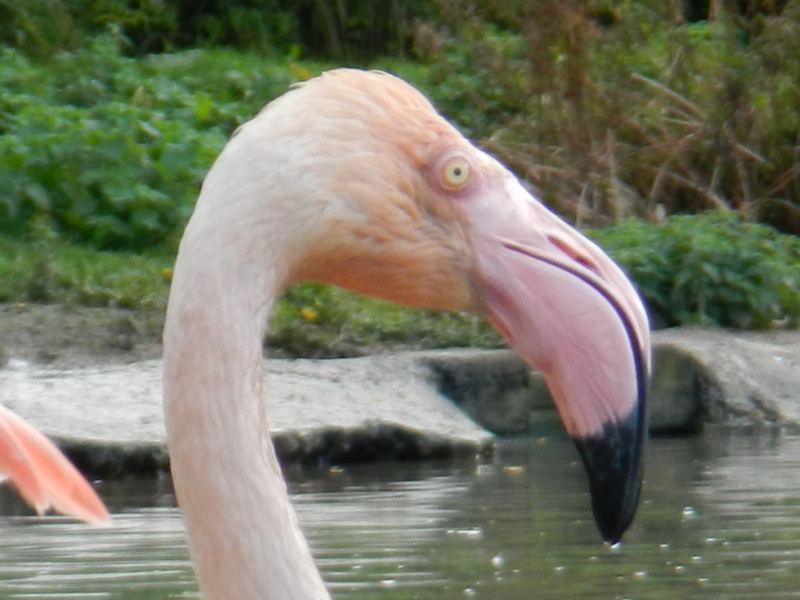 Using iSpot has definitely boosted my knowledge of the natural world. You can also post forum topics on iSpot and there are keys to identifying wildlife there, so I suggest you get on there straight away. I hope many of you will take part in the Big Garden Birdwatch and I will be delighted if you shared your results via comment.